AutoCheck® brings accurate, accessible and affordable vehicle history information to your WebManager inventory, reducing risk for dealers and their customers. AutoCheck reports contain state title and registration data, plus data from independent sources, salvage yards, recycling facilities and auctions, including police-reported accident data from all 50 states. The AutoCheck Score℠ consolidates AutoCheck data into an easy-to-understand "score" that helps you better interpret and explain vehicle history events to your customers. The AutoCheck Score Range allows you to compare vehicles of similar age and class when appraising used vehicles. Share reports on your website. 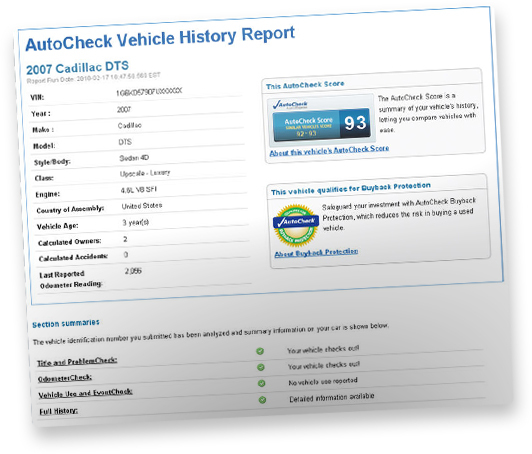 Display free vehicle history reports with an AutoCheck Score℠ on your website listings or other third party websites. AutoCheck allows free access and report updates for 90 days. Supports more than 75 dealership websites providers and portals, including eBay® Motors. * Subject to AutoCheck Buyback Protection terms and conditions. How AutoCheck works with DeskManager. WebManager's AutoCheck Integration will automatically run and display AutoCheck reports on your inventory. Users viewing your listings on eBay or on your website can view your AutoCheck reports for free. If you don’t have an AutoCheck account, you can set AutoCheck integration to display a link in your listings for users to run a free record check or pay for a full AutoCheck report. Copyright © 2006 - 2019 AutoManager, Inc. All rights reserved.